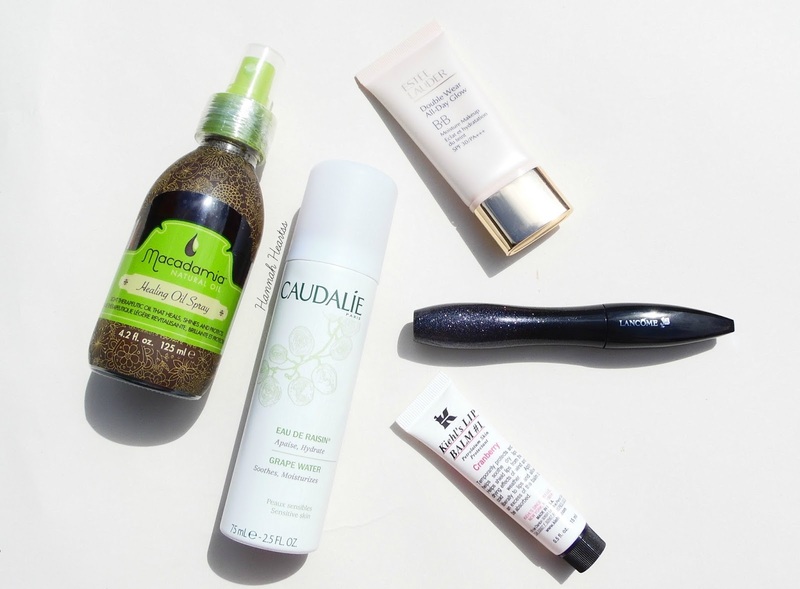 With the warm weather looking to stay, I needed to switch out my beauty product essentials for summer friendly ones. During the summer I feel like I need all new products than what I use in the rest of the year because I need everything waterproof and sweat proof as well as being hydrating for the skin. During the summer months, my hair really suffers. It needs extra hydrating products as well ones swell as having something that will keep it looking smooth and glossy. The Macadamia Healing Oil Spray* £19 has been perfect for my hair. I spray this onto the ends of my hair where it tends to be most dry while it is towel dry. It provides my hair with instant hydration while making it frizz free and angel free. It doesn't leave my hair looking or feeling greasy either no matter how much I use. It also has natural UV protection too which is perfect for days out in the sun. I cannot say enough good things about the Caudalíe Grape Water Spray* £7. I have used this so much and I don't see myself stopping any time soon. It is the perfect product to cool down the skin during a hot day and also hydrates the skin. I have been using this throughout the day on my face and it doesn't effect my makeup. I do spray some on my arms too if I am extra hot. I can't recommend this stuff enough, this has become a summer handbag essential. The Estēe Lauder Double Wear BB Cream £28 is perfect for the warmer months. It provides a high coverage for the skin while feeling light weight and doesn't look cakey either. This is so long lasting too, even when I spent the day in the sun, and doesn't melt off throughout the day. It also has an SPF of 30 which is perfect for me as I sometimes forget to apply SPF in the morning. Next up is the Lancôme Hypnôse Star Waterproof Mascara* £18. I have been in serious need of mascara that is waterproof and this one does an amazing job. It is a drier formula which I am not used to but after using it a couple of times I have got used to it. You can layer this mascara up and get a more intense lash look or you can just apply one coat and get a very natural lash. When this one says waterproof it means it, I have worn this underwater and it will looked perfect afterwards. The packaging on this mascara is stunning with the glitter effect. My final summer essential is the Kiehl's Lip Balm #1 in Cranberry £8. This is a thicker lip balm, only the tiniest amount needs to be applied to keep your lips hydrated. As it is slightly thicker it lasts forever on the lips. This lip balm also has an SPF 7 so it will help protect your lips in the sun, there is nothing more painful than sunburnt lips! The cranberry scent is divine but if cranberry isn't your thing there is also other flavours available. If you want to purchase anything you see here or anything from the Cosme-De website you can use my discount code HHSUMMER until the 31st of July 2015 for 15% off and a free sample of the SKII Stempower.